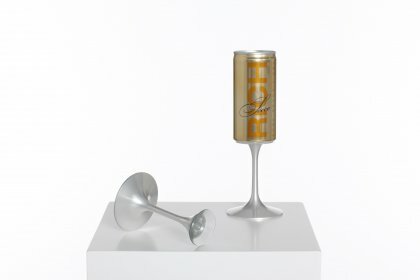 Many people these days have an aversion to drinking from a can, even for beer, cola or other soft drinks  often to the point of abstaining completely from the consumption of canned refreshments. Such sensitivities are, however, still far from the drinking-culture low marked by sparkling wine served in tin. It does not help for the palatable substance to be promoted by gossip magazine starlet Paris Hilton. 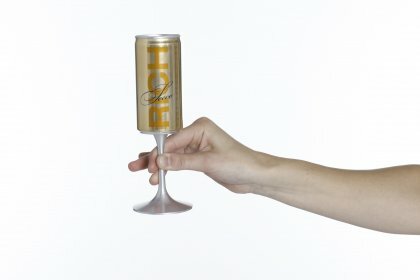 Champagne, sparkling wine or Prosecco from the can are an absolute no-go  unless you combine the small can with a stylish base, an elegantly formed stem that not only serves to protect the bubbly from our warm hands, but also constitutes a kind of post-modern interpretation of a traditionalized ritual. Cheers! Salute! A votre santé!